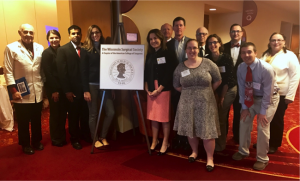 The Wisconsin Surgical Society was again awarded an Advocacy Grant from The American College of Surgeons Health Policy and Advocacy Group (HPAG) to support and sponsor surgeon participation in the physician lobby day at the Wisconsin State Capital known as Doctor Day. This year’s event was held on March 29th. Approximately 500 physicians and medical students participated in the day’s activities. There were a total of 26 participants that attended as part of the WSS contingency, a number greatly increased from years prior. The support from the ACS did not stop at grant funding as the ACS also sent State Affairs Associate Chris Johnson to attend from Washington DC. 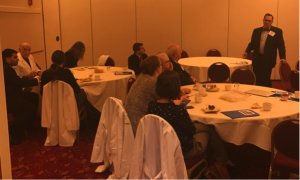 Mr. Johnson provided an overview of the ACS advocacy activities and ACS positions on legislative issues during the WSS Members-Only Breakfast Meeting. Also presenting at the Breakfast Meeting was Chair of the WSS Policy Planning and Government Relations Committee Amy Liepert, MD, FACS. There was surgeon representation from both private practice and academic centers and from urban and rural practices. Residents participated from 3 of the 4 general surgery residencies in the state as well as one plastic surgery resident. 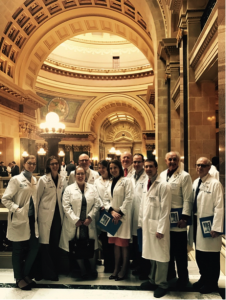 Doctor Day is an important opportunity to draw attention to physician and medical or surgical issues in the state legislature as well as providing an optimal opportunity to build relationships between legislators and their staffs with their surgeon constituents from their home district. This year’s meetings resulted in new relationships being developed, discovery of previous interactions (a legislator remembering an attendee taking care of their child in the past), and building on already existing relationships. Not every health related legislative issue directly impacts surgical care, and ultimately, many do not. But, sometimes, proposed legislation can have effects that are not immediately obvious. Wisconsin is not facing any ‘hot-button’ surgical issues in the current legislative session. However, the HOPE Agenda bills, that pertain to opioids, will have an effect on surgical practice. Most recently instituted was a mandate for all prescribing physicians to check the ePDMD prior to issuing a narcotic or other scheduled medication. While there can be some personal angst about the mandate to require this of physicians, it is also a good example of feedback to the legislative process. Direct feedback from physicians and surgeons delayed implementation until the ePDMD could be modified in a way that would make it technologically more feasible to comply with checking it. This feedback also resulted in a change to some rules to allow for surrogate medical personal to check the record on behalf of the prescribing physician as long as an adequate work-flow is established to address any prescription concerns with the prescribing physician. Another item was discussed at this year’s Doctor Day that at first pass seemed to not have any impact on surgery. It was a Budget request by the Governor to provide $500,000 each year to support a Child Psychiatry Consultation Telemedicine Program. It would provide state funding to continue telemedicine support between primary care providers and pediatric psychiatrists within the state. This is an interesting model of physician-to-physician consulting of a very specialized area to general practitioners in order to provide expanded care to rural areas. This was supported by the WSS surgeons in attendance, as it could provide for a viable model of expanded surgical consultation in the future to the rural areas of the state. Doctor Day is not about a one-time interaction with each participants state legislator or staff member. The purpose is to show a organized solidarity of the house of medicine to the legislative process that strongly impacts the care of our patients and can intimately affect the care they receive. The relationships that are initiated or reinforced between local legislators and surgeons is invaluable. It is these local relationships that are critical when positive or negative legislation is introduced that affects the care of surgical patients. Physicians, but particularly surgeons, are held in high regard in their communities and by legislators alike. This allows surgeons to fulfill the much needed role of trusted advisor to their local legislators and have great impact on patient care and care delivery. This is the importance of days such as Doctor Day. Thank you to all who attended. 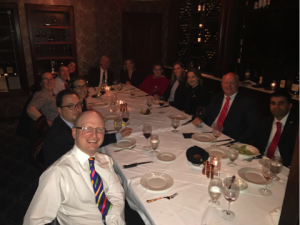 The 26 WSS attendees included 6 surgical residents representing 3 of our 4 state residency programs Jennifer Philip, MD (UW); Rebecca Gunter, MD (UW); Jacqueline Israel, MD (UW); Nick Coorough, MD (Gundersen); Liska Havel, MD (Gundersen) and Rachel Landisch (MCW). WSS members included: Neel Karne, MD, FACS; Jonathan Kohler, MD, FACS, MD; Elise Lawson, MD, FACS-candidate; Amy E. Liepert, MD, FACS; James Mahoney, MD, FACS; Tracy McCall, MD, FACS; Philip Redlich, MD, FACS; Max Wohlauer, MD, FACS (Retired) Rodney Malinowski, MD, FACS; and Arthur Angove, MD, FACS. 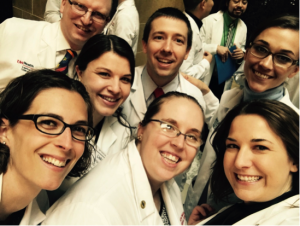 These surgeons represented 10 different institutions from throughout the state. Staff present included: Chris Johnson, ACS, State Affairs Associate, Terry Estness, and Terry Estness (both of WSS). Doctor Day 2018 date is to be determined. Doctor Day 2017 WSS Breakfast Meeting. ACS State Legislative Affairs Associate Chris Johnson speaking.